C12G has created an Image Contextualization Guide to give guidance on how to create and configure a VM Image to work in the OpenNebula environment. The new guide proposes techniques to create a VM Image from scratch and to prepare existing images to run with OpenNebula. This article is part of the new Knowledge Base that is being extended by C12G Labs. A couple of months have passed since the release of OpenNebula 2.2 (Cat’s Eye) and we have been quite active since then. The next release of OpenNebula is getting in shape fast and a significant amount of new features are already in the repository. Let’s start reviewing the not-so-glamorous new features. One of the main themes for the next release is database refactoring. The new DB backend of OpenNebula features a schema free (document-oriented) implementation of the data model on top of a SQL DB. This will give us enough flexibility to easily extend the attributes and resources managed by OpenNebula at no performance cost. Also, the next release includes DB versioning and a tool to upgrade from previous versions of OpenNebula. Another important area of work has been networking. We have evolved the network manager component to provide out-of-the-box integration with typical VLAN technologies. In particular, you’ll be able to choose from 802.1Q VLAN tagging, Open vSwitch and simple isolation based on ebtables filters. You’ll also be able to set up simple firewalling rules for each VM specifying black/white TCP/UDP port settings. The next release will also feature important improvements in VM management. Virtual Machine templates can now be stored in OpenNebula so you can easily instantiate pre-defined configurations, and share them with other users. This new VM Template pool along with the existing Network and Image will give users and administrators a very flexible and simple way to define and instantiate virtual infrastructures. We have also re-factored the Image Repository to adopt a pluggable architecture that can integrate any storage backend, with a filesystem-based repository provided in the next release. The Image Repository can be now further integrated with external catalogs. The next release will also showcase a preview of this hybrid cloud storage, that integrates Amazon S3 and OpenNebula, to download, contextualize and integrate S3 images in your local Image Repository. Sunstone has also received some attention from the team, being extended to accommodate all the new features and some rough edges have been polished. We have also added support for plug-ins, enabling the easy customization of the control panel. There is also a couple of new specific features for the interface: VNC access to VM instances through the web browser using noVNC; and graphical information about the health of your cloud. And last but not least, the multi-tenancy support for OpenNebula has been considerably improved with the addition of groups and access control lists (ACLs). This will provide great flexibility to share resources among users and to define user roles. Grounded in this new functionality, you’ll be also able to experiment with the new Virtual Data Center (VDC) manager. Using a muti-tier architecture you’ll be able to aggregate multiple OpenNebula’s (zones) and define within them multiple, isolated VDCs. Finally as you my have noticed from the title, there are so many new features (as well as changes in the database and internal API’s) that we have decided to upgrade the major versioning number of OpenNebula to 3. The changes in the public APIs are minimal and we expect that current applications will run without modifications on top of OpenNebula 3.0. OpenNebula 3.0 also includes contributions from several members of our community, such as CERN, FermiLab, and Harvard University’s SEAS. A beta version of OpenNebula 3.0 (codename Iris) will be ready for testing by the end of June and its stable release is scheduled on July 20th. 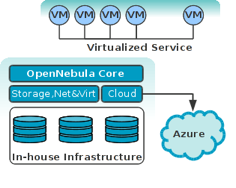 As usual, OpenNebula releases are named after a Nebula. The Iris Nebula (NGC 7023, Caldwell 4) is a reflection nebula in the constellation of Cepheus. We will appreciate your feedback on these new features. Thanks! C12G Labs announced today new professional services offerings, which will enable customers and partners to take full advantage and maximize the value of OpenNebula industry-leading cloud management capabilities. C12G provides proven best practices and guidance from experts to design, deploy and operate the best cloud architecture for existing workload, processes and IT infrastructure environment. The new services, tailored to customer experience and requirements, include consulting, engineering, development and training. C12G has created a Scalability Guide to give guidance on how to install and tune OpenNebula for optimal and scalable performance in your environment. The software comes with several modifiable parameters that can to be adapted to the specific needs of your infrastructure and workload. C12G Labs announced today a major new release of OpenNebulaPro, the enterprise-class edition of the OpenNebula Toolkit. This is the third major release of the commercially supported, enterprise-ready distribution of the OpenNebula open-source toolkit, which is used by thousands of organizations worldwide. OpenNebulaPro 2.2 offers a comprehensive solution for the management of virtualized data centers to enable private, public, hybrid (cloudbursting) and virtual private clouds. OpenNebulaPro 2.2 extends the fault-tolerance features of previous versions, includes out-of-the-box integration with data-center’s monitoring systems, and brings the new Sunstone web application. C12G complements OpenNebulaPro 2.2 with additional tools to simplify the deployment and operation of Cloud instances and to help in the migration path from previous versions. As result of its certification process, it also provides a better integration with richer functionality on VMware and XenServer hypervisors. OpenNebulaPro 2.2 includes state-of-the-art features developed to meet the requirements from High Performance Computing, Hosting and Telecom cloud environments. Telecom Operators can offer Virtual Private Cloud environments to extend the Private Clouds of their custormers over virtual private networks, so offering a more reliable and secure alternative to traditional Public Cloud providers. Supercomputing and leading research centers use OpenNebula to build clouds for hosting virtualized computational environments or for providing users with new “HPC as a service” resource provisioning models. Hosting providers are adopting OpenNebula to manage their infrastructure and to build new IaaS cloud offerings. A recommendation for version 1.1 of the Open Cloud Computing Interface (OCCI) was recently released by the Open Grid Forum (OGF) (see OGF183 and OGF184). To add OCCI 1.1 support for OpenNebula, we created the Ecosystem project “OCCI for OpenNebula”. The goal of the project is to develop a complete, robust and interoperable implementation of OCCI 1.1 for OpenNebula. Although the project is still in an early stage, today we released a first version that supports creating and deleting Virtual Networks, Images and Machines. Information on installation and configuration of the OCCI 1.1 extension can be found in the Wiki of the project. C12G has created an introductory article to describe how to integrate public clouds with OpenNebula for Cloudbursting. The white paper describes the integration of public clouds with private cloud instances running OpenNebula. A general provisioning scenario that combines local and external cloud resources is first described. Afterwards the architecture of OpenNebula and the main components involved in a hybrid cloud setting are briefly presented. The document ends with some considerations and the minimum requirements to deploy a service in an hybrid cloud. C12G/OpenNebula will participate in the panel about Cloud Computing Fostering Innovation of the workshop Towards a Cloud Computing Strategy for Europe: Matching Supply and Demand organized by the European Commission to help identify the main elements of a European Cloud Strategy. This panel will discuss the opportunities presented by the cloud, interoperability and standards issues, and the potential for innovation. Other panelists are senior-management representatives of European companies, organizations and networks, and the European Parliament. The workshop is part of the 1st Digital Agenda Assembly. In this post, I will explain how to install OpenNebula on two servers in a fully redundant environment. This is the English translation of an article in Italian on my blog. The idea is to have two Cloud Controllers in High Availability (HA) active/passive mode using Pacemaker/Heartbeat. These nodes will also provide storage by exporting a DRBD partition via ATA-Over-Ethernet; the VM disks will be created on logical LVM volumes in this partition. This solution, besides being totally redundant, will provide high-speed storage because we use snapshots to deploy the partitions of the VM, not using files on an NFS filesystem. Nonetheless, we will still use NFS to export the /srv/cloud directory with OpenNebula data. As a reference, this is the configuration of our own servers. Your servers do not have to be exactly the same; we will simply be using these two servers to explain certain aspects of the configuration. Install Ubuntu server 64-bit 10.10 on the two servers and enabling OpenSSH server during installation. In our case, the servers are each equipped with a double-disk 1TB SATA in hardware mirror, on which we will create a 40 GB partition (sda1) for the root filesystem, a 4 GB (sda2) for the swap, a third ( sda3) of 1 GB formetadata , a fourth (sda5) with 40 GB for the directory /srv/cloud/one replicated by DRBD, and a fifth (sda6) with the remaining space (approximately 850 GB) that will be used by DRBD for the export of VM filesystems. In terms of network cards, we have a total of three network cards to each server: 2 (eth0, eth1) will be configured in bonding to manage data replication and communicate with the compute nodes in the cluster network (SAN) on the class 172.17.0.0/24 and a third (eth2) is used to access from outside the cluster on the LAN 172.16.0.0/24 with class. Unless otherwise specified, these instructions are specific to the above two hosts, but should work on your own system with minor modifications. I prefer to configure a MySQL circular replication rather than to manage the launch of the service through HeartBeat because MySQL is so fast in the opening; having been active on both servers, they save a few seconds during the switch in case of a fault. As already mentioned, the two DRBD partitions will be visible through the network, although in different ways: one-disk will be exported through NFS, data-disk will be exported by ATA-over-Ethernet and will present its LVM partitions to the hypervisor. Finally we have to set idmapd daemon to correctly propagate user and permission on network. There are two packages that can handle high available services on Linux: corosync and heartbeat. Personally I prefer heartbeat and provide instructions referring to this, but most configurations will be through the pacemaker, then you are perfectly free to opt for corosync. Now we’ll configure cluster services via pacemaker. primitive lan_ip IPaddr params ip=172.16.0.250 cidr_netmask="255.255.255.0" nic="eth2" op monitor interval="40s" timeout="20s"
primitive san_ip IPaddr params ip=172.17.0.250 cidr_netmask="255.255.255.0" nic="bond0" op monitor interval="40s" timeout="20s"
primitive drbd_one ocf:linbit:drbd params drbd_resource="one-disk" op monitor interval="40s" timeout="20s"
ms ms_drbd_one drbd_one meta master-max="1" master-node-max="1" clone-max="2" clone-node-max="1" notify="true"
primitive fs_one ocf:heartbeat:Filesystem params device="/dev/drbd/by-res/one-disk" directory="/srv/cloud/one" fstype="ext4"
primitive drbd_data ocf:linbit:drbd params drbd_resource="data-disk"  op monitor interval="40s" timeout="20s"
ms ms_drbd_data drbd_data meta master-max="1" master-node-max="1" clone-max="2" clone-node-max="1" notify="true"
primitive aoe_data ocf:heartbeat:AoEtarget params device="/dev/drbd/by-res/data-disk" nic="bond0" shelf="0" slot=="0" op monitor interval="40s" timeout="20s"
We will modify this configuration later to add OpenNebula and lighttpd startup. LVM2 will allow us to create partitions for virtual machines and deploy it via snapshot basis. Install the package on both machines. We have to modify the filter configuration to allow lvm scan only to DRBD disk. ATTENTION: Ubuntu uses a Ramdisk to bootup the system, so we have to modify also lvm.conf file inside ramdisk. About configuration: this is my oned.conf file, I use Xen HyperVisor, but you can use also KVM. Now copy the init.d script from source to /etc/init.d but not set it to startup ad boot. su - oneadmin -s /bin/sh -c "$DAEMON start"
su - oneadmin -s /bin/sh -c "$SUNSTONE start"
su - oneadmin -s /bin/sh -c "$SUNSTONE stop"
su - oneadmin -s /bin/sh -c "$DAEMON stop"
Sunstone is the web interface for Cloud administration, if you do not want to use the command line… works on port 4567 and is not encrypted, so we’ll use lighttpd for proxy requests to HTTPS encrypted connection.